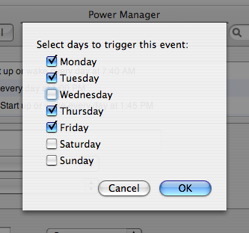 The Days window lets you select any combination of days to trigger a Daily event. This button closes the Days window without saving changes. This button closes the Days window and alters the current event's Daily options. No changes are applied to the schedule at this point. The OK button is disabled if no days are enabled.